It has become evident that there has been some confusion with regard to Question 1 of the consultation. The question asks if you are supportive of the proposal and this refers to the proposal to repeal the Offensive Behaviour Act. Our preferred answer to this is ‘Fully supportive’. Some people have clearly thought it was referring to the Offensive Behaviour Act itself and have ticked ‘Fully opposed’ but then gone on to provide reasons which set out why they are, in fact, in favour of the proposal to repeal. See below. 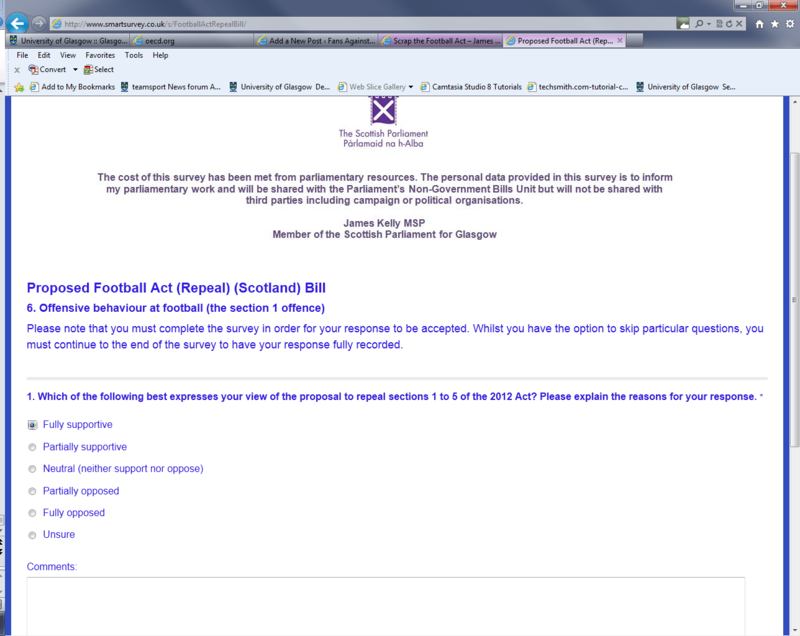 If you have done this – or think you might have – then please email James Kelly MSP (James.Kelly.MSP@Parliament.Scot) using the email address you used when making your submission and tell him you wish to change your answer to Q1 to Fully Supportive. This is very important because they will count your submission as being in favour of the Offensive Behaviour Act if you don’t change this. Previous Previous post: 2 days left to scrap the Act!